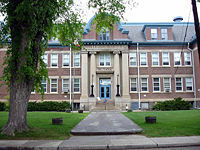 A high school is the name used in some parts of the world, particularly in North America, to describe an institution which provides all or part of secondary education. The precise stage of schooling provided by a high school differs from country to country, and may vary within the same jurisdiction. Though they may go by different names, most countries around the world have schools that are similar in philosophy to high schools. In most parts of the world it is the last stage of compulsory schooling, and prepares a student to continue on to higher education, such as a college, university, or vocational schooling. Graduation from high school is considered a significant rite of passage in many cultures, particularly the United States. In addition to completing this level of academic studies, high schools offer adolescents support in making the transition from childhood to adulthood in social, career, and other interests through extra-curricular activities as well as purely academic studies. High schools face serious challenges in fulfilling these goals, both academically and socially. In many cases the social environment of high schools is far from ideal, with the result that many students fail to achieve their potential and leave without graduating. Nevertheless, the establishment of high schools and the availability of this level of education to all students is beneficial to society. High schools and similar institutions provide the final stages of secondary education. In some countries, they provide the last stages of compulsory education while in others they are advancements for students who plan to attend tertiary education. Either way, these schools have two significant purposes. First, they are designed to meet the educational expectations set by the state or government, which usually includes a fundamental understanding of mathematics, basic sciences, language skills, geography, government, and history. Secondly, these institutions are charged with preparing students for life after high school, which means either providing technical/vocational skills so that students can enter the workforce, or preparing students for advanced study in college. Additionally, high schools offer adolescents support in making the transition from childhood to adulthood in social, career, and other interests through extra-curricular activities as well as purely academic studies. Graduation from high school is considered a significant rite of passage in many cultures, particularly the U.S.
Before public high schools were first developed in the United States, secondary education in Europe and the West was limited to private tutors and institutions whose main goal was to prepare its students for entrance into a university. The public high school movement, which started in the Massachusetts, was established as a way to satisfactorily educate and prepare for college a larger number of students. By the late nineteenth century the U.S. was the first country to have free, public high schools. By the beginning of the twentieth century, high schools started to be developed in all parts of the country, as a larger middle class was developing and the benefits of educating younger people before they entered the workforce became realized, particularly in urban areas. The large farming communities and rural populations in the United States during the beginning half of the twentieth century were the last to establish public high schools, as males of high school age were already employed in manual labor. High schools for girls and minorities were slow coming as well, but by the middle of the twentieth century high schools were the norm in every state. Individual states, counties, and school districts have considerable leeway in how they choose to divide their school levels. A few American schools still include all grades seven through twelve, but usually grades nine through twelve constitute high school, with middle school offering grades six, seven, and eight. Students in American high schools are known according to their grade as "Freshmen" (ninth grade), "Sophomores" (tenth grade), "Juniors" (eleventh grade), and "Seniors" (twelfth grade). Students generally graduate from high school in the year of their eighteenth birthday if they were born between January 1 and August 31, but this varies by state depending on the kindergarten cut-off date, which ranges from August 1 to January 1. As a practical matter, while laws in most states mandate school attendance at least until graduation or age 16, many require attendance until age 17 or 18. Enforcement of truancy laws is sometimes sporadic. Conversely, students who have failed a grade may remain in high school past the age of 18. In general, students over 19 attend alternative classes to receive a high school diploma or General Educational Development (GED) certificate. State laws vary on the cut-off age for students to receive free public education services. A high school diploma or GED certificate is usually required for entrance into a two or four-year college or university and to other post-secondary education programs. In 1998, the average American graduation rate from high school was 71 percent. High schools can be sub-classed as general high schools, vocational high schools (VoTech schools), and college preparatory high schools (prep schools) and alternative high schools. Most high schools are general high schools. These schools offer a wide range of educational opportunities intended for the widest range of students possible. These general population schools offer college preparatory classes for advanced students, general education classes for average students, and remedial courses for those who need additional academic support. Students can "mix and match" course levels according to their own abilities or interests. In some school districts exceptionally high-performing students are offered enrollment at a district college preparatory high school. Traditionally "prep schools" in North America were usually private institutions, though most medium or large public (state) school districts now offer prep schools for advanced students. Public prep schools draw the top students from their district and have strict entrance requirements. All academic classes offered in these schools are classified as honors, International Baccalaureate, or Advanced Placement. Vocational high schools offer hands-on training to students to prepare them for careers in fields such as information technology, marketing, business, engineering, and the medical professions. While some graduates of vocational or career and technical education high schools go directly into a trade, others pursue postsecondary education. Vocational high schools are sometimes but not always associated with low-performing students (not necessarily special education students) or those at risk of dropping out of traditional schools, in order to offer these students the chance to earn their diploma and have marketable skills after graduation. The Association for Career and Technical Education is the largest national association of professionals dedicated to career and technical education. Alternative high schools are institutions designed for students who have major disciplinary or mental health difficulties that make it problematic to educate them in traditional high school settings. 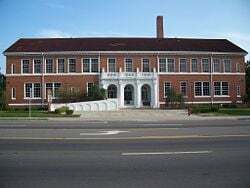 Some alternative high schools are assigned as security risks, where the school houses students who are not yet old enough to legally leave school and are considered a danger to other students or teachers, but have not been convicted of a crime. Some alternative high schools are dedicated to students with drug or mental health difficulties and have medical and psychological staff on site. A few of these schools include a nursery and a child care staff so that teen parents can finish their education without having to find child care during the school day. Alternative high schools may have their own campus, but others are located in a section or wing of a general high school. Another form of high school that has emerged is the online high school. Stanford University's own Education Program for Gifted Youth received a generous donation and used it to create the first truly complete online high school, with an interactive and advanced program for advanced learners. Most high schools are generally the largest of compulsory school buildings, and have facilities similar to but larger than those at middle schools. Classrooms tend to be larger, and specialty rooms, such as science laboratories, art rooms, computer laboratories, technology, and industrial work spaces, often have better and more complex equipment as these subjects tend to become more intensive when studied at the high school level. Nearly all states require high schools to have cafeterias which provide food (for a cost) to its students, as well health offices. 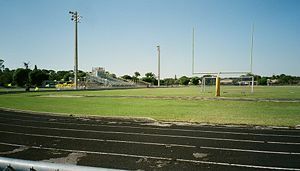 Gymnasiums for physical education and outdoor athletic spaces are common. Auditoriums which can double for theatric and concert performances as well as school meetings are also commonly included. In South Africa, high school begins at eighth grade. Students study for five years, at the end of which they write what is known as "matric." Students must attain a pass in their Home Language, Additional Language, Mathematics or Mathematical Literacy, and Life Orientation to progress on to university. Students in Kenya's major secondary schools (high schools) take four years to prepare for college. Kenya Certificate of Secondary Education are undertaken at the end of secondary education. As of 2008, the government has introduced plans to offer free secondary education to all. There are three types of secondary school: Private schools, government-aided schools, and harambee schools. The government-aided schools are more selective and only one out of four children are accepted. Acceptance is based on a child’s score on the Kenya Certification of Primary Education (KCPE). Most of the government-aided schools are boarding schools. In Nigeria, students spend six years in secondary school. At the end of three years, they take the Junior Secondary School exam (JSS3 exam) which is a qualifying exam for senior secondary school. By Senior Secondary School Class 2 (SS2), students are taking the GCE O Levels exam, which is not mandatory, but most students take it to prepare for the Senior Secondary School Exam. The Senior Secondary School Exam is taken in the last year of high school (SS3). Private organizations, the state or federal government manages secondary schools in Nigeria. In India, where education is compulsory until age 14, high school is a grade of education which includes Standards IX to XII. Usually, students from ages 14 to 18 study in this section. These schools may be affiliated to national boards like CBSE or ISC or various state boards. The Japanese word for a high school is kōtōgakkō (高等学校; literally high school), or kōkō (高校) in short. 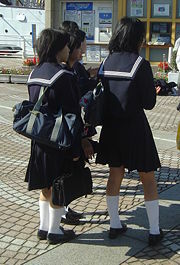 High school in Japan covers grades 10 through 12, and is not mandatory. Most Japanese people attend high school. The third year of high school in Japan is allotted for students to prepare for college exams known as juken （受験）. Others may wish to settle for a job instead. High schools in Japan are referred to by MEXT as "upper secondary schools." In South Korea, students from grades 10 through 12 attend high schools. High schools in South Korea may also have subject specialty tracks. For example, students who have a talent for science, foreign language, physical activity, art, and so forth may choose to go to a science, foreign language, or other specialty high school (hangul:특수목적고등학교; Revised:Teuksu-mokjeok godeung hakgyo). Korean students may also choose to go to common high school (hangul:인문계 고등학교; Revised Romanization:Inmun-Gyae godeung hakgyo), while other students may choose a vocational track high school which emphasizes agriculture, commerce, or technical trade curricula (hangul:전문계 고등학교; Revised Romanization: Jeonmun Gyae godeung hakgyo). The Finnish education system charges no tuition fees for full-time students and free meals are served to pupils. The second level education is not compulsory, but an overwhelming majority attends. There is a choice between upper secondary school (lukio, gymnasium) and vocational school (ammatillinen oppilaitos, yrkesinstitut). Upper secondary school, unlike vocational school, concludes with a nationally graded matriculation examination (ylioppilastutkinto, studentexamen). Passing the test is a prerequisite for further education. The system is designed so that approximately the lowest scoring five percent fail in each exam and also five percent achieve the highest grade. The exam allows for a limited degree of specialization in either natural sciences or social sciences. Graduation from high school is an important formal family event, like a christening, wedding, or funeral. The Finnish system resembles the German gymnasium. Usually the students that attend a gymnasium school in Germany are the most academically strong students upon leaving primary school. The gymnasium helps to prepare students to enter a university, and is the most rigorous and prestigious level of secondary education in Germany. Gymnasia are thus meant for the more academically-minded students, who are sifted out at about the age of 10 to 13, a system similar to the eleven plus exam formerly used to select grammar school entrants in the United Kingdom. Those students who are not qualified to enter gymnasia attend one of the three other types of German secondary schools: Realschule, Hauptschule, or Gesamtschule. In the Netherlands, high school is called "middelbare school" (literally: "Middle school)" and starts right after the eighth grade of primary school (group eight). The pupils who attend high school are around the age of 12. Because the education in the Netherlands is compulsory between the ages of 5 and 16 (and partially compulsory between the ages of 16 and 18), all pupils must attend high school. The high schools are part of the voortgezet onderwijs (literally: "Continued education"). The voortgezet onderwijs consist of three main streams; vmbo (four grades), havo (five grades) and vwo (six grades). The pupils usually cannot choose the type of secondary education they want to follow, as it depends on the opinion of the group eight teacher. 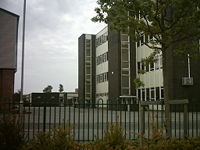 Wetherby High School, a former secondary modern school in Wetherby, West Yorkshire that adopted the term "High School." In France, high schools are called Lycée. The lycée prepares the student to pass the baccalauréat (known as le bac); this allows the student to continue to higher education, studies in technology, or directly enter their profession, depending on the type of baccalauréat. Public French universities are required to accept any student who attains the baccalauréat général. However, there are also Grandes écoles, elite higher education establishments which function outside of the public university system, that traditionally have produced France's highest ranking politicians, executives, and scientists. Entrance to these institutions requires classes préparatoires aux grandes écoles, two to three-year courses, often offered by historical, prestigious, and selective lycées. In Ireland, students attend secondary school from first year through sixth (usually aged 12 to 18), with an optional fourth year known as "transition year." Once a student turns 16, they have the option to leave school legally. Secondary school is divided into three parts; the "junior cycle," encompassing first year through third, at the end of which students sit the Junior Certificate; "transition year," an optional fourth year; and the "senior cycle," from fifth year through sixth, at the end of which students sit the Leaving Certificate. The term "high school" is not used officially in the United Kingdom, although many secondary schools call themselves high schools, particularly in Scotland, the north of England, and in some parts of Wales. Secondary schools in the state sector in the UK generally cater for children between the ages of 11 and 16 or 18, in two stages (Key Stage 3 and 4). Compulsory education ends in Key Stage 3, but students may elect to go on for two more years in programs offered by Sixth Form departments. In the private sector pupils often transfer to the final stage of education at age 13. High School in Saskatchewan, Canada. Secondary schooling in Canada differs depending on the province. In Ontario, high school is usually from grades 9 to 12, but can be from 7 to 12 depending on the school's location (urban/rural). In most urban areas in Ontario, schools with grades 7 and 8 are referred to as "middle school" or "senior public." When grades 7 to 9 are together, it is referred to as "junior high school." In Alberta high school starts in grade 10 and finishes in grade 12. However in Quebec, high school is from Secondary 1 to Secondary 5 (grades 7 to 11). In Quebec most students follow high school by attending a CÉGEP, which is comparable to a two-year junior college and is obligatory for Quebec students wishing to go on to university. Vocational CÉGEP is three years. Education is compulsory up to the age of 16 in every province in Canada, except for Ontario and New Brunswick (where the compulsory age is 18). Originally schools were divided by religion, although most provinces have since abolished this separation. Provinces such as Ontario, Alberta, and certain cities in Saskatchewan are exceptions, publicly funded by a separate school board. Quebec replaced their religious based system with an English and French school board system in 1998. Students in Quebec can only attend a publicly funded English-language school (through high school) if at least one of their parents attended an English-language school somewhere in Canada. Otherwise, their only publicly funded option would be a French-language school. This requirement was implemented to encourage the children of immigrants living in Quebec to attend French-language schools. Of course, anyone is free to choose to pay to attend a private school in the language he or she chooses. In Mexico, the equivalent of high schools are called upper-secondary schools. Unlike the rest of basic education in the country, this stage is non-compulsory and has three pathways: general upper-secondary, technical professional education, and technological upper-secondary, which helps determine if a student will go on to college or join the workforce upon completion. In Australia the terms "high school" and "secondary college" may be used interchangeably. In the Australian Capital Territory high school is years seven to ten, and students go to senior school for years 11 and 12. In some states TAFE institutes/colleges offer high school equivalent courses, usually undertaken by adult students who left school without completing Year 12 leaving certificate requirements. There are also private commercial education facilities offering Year 12 leaving certificate courses, often to students wishing to improve on their high school results in order to obtain entry to, or better placement opportunities at, university. The exact length of secondary schooling varies from state to state, with high schools in New South Wales and Victoria serving years 7 to 12, and Western Australia, Queensland, and South Australia serving years 8 to 12. The Northern Territory has introduced a middle school system for years seven to nine, with high school consisting of years 10 to 12. In Brazil, high school is officially called Ensino Médio and is also informally known as Colegial or Segundo Grau. It is the last phase to the basic education in this country. Brazilian high school lasts three years, attempting to deepen what students learn in elementary school and junior high school. A Brazilian high school student is referenced by their year: first, second, and third years. Unlike many other countries, Brazilian students have no final test to conclude their studies. Their completion depends only on the final grade on each subject. Each university develops its own test to select new students. Enem, a non-mandatory national exam, evaluates high school students in Brazil and is used to rank schools, both private and public. Secondary education in Argentina is called Polimodal ("polymodal," that is, having multiple modes), since it allows the student to choose his/her orientation. Polimodal is not yet obligatory but its completion is a requirement to enter colleges across the nation. Polimodal is usually 3 years of schooling, although some schools have a fourth year. In Chile secondary school, (Enseñanza media), is for teenagers from 13 to 18 years old, and is divided into four grades. It is also divided into two different pathways: Scientific-humanities approach in which students can choose a major in either science (mathematics, physics, chemistry, biology), or humanities (literature, history, sociology), and technical-professional education where students receive extra education in the so-called "technical" areas, such as electricity, mechanics, metalwork, and the like. This second type of education is more typical of public schools (Liceos), to give students from poorer areas a chance to work right away after completion of high school, as a way to fund a possible higher education career later. ↑ 1.0 1.1 Donald B. Holsinger, History of Secondary Education, Encyclopedia of Education. Retrieved August 24, 2008. ↑ Information Please® Database, State Compulsory School Attendance Laws Pearson Education, Inc., 2007. Retrieved August 24, 2008. ↑ Jay P. Greene, High School Graduation Rates in the United States, Manhattan Institute for Policy Research (2001). Retrieved August 14, 2008. ↑ Robert A. Gable et al., "Changing Perspectives on Alternative Schooling for Children and Adolescents With Challenging Behavior," Preventing School Failure 51(1) (Fall 2006): 5. ↑ Stanford University, Online High School. Retrieved August 25, 2008. ↑ Washington: GPO for the Library of Congress, A Country Study: South Africa (2005). Retrieved August 14, 2008. ↑ Encyclopedia Beta, Education in India. Retrieved August 14, 2008. ↑ Thomas P. Rohlen, Japan's High Schools (University of California Press, 1983, ISBN 0520048636). ↑ Ministry of Education, Culture, Sports, Science and Technology, Elementary and Secondary School. Retrieved August 14, 2008. ↑ Andrea Matles Savada and William Shaw, (eds. ), South Korea: A Country Study (Washington, DC: GPO for the Library of Congress, 1990). Retrieved August 14, 2008. ↑ Encarta® Online Encyclopedia, Gymnasium (school) (Microsoft Corporation, 2008). Retrieved August 25, 2008. ↑ United Nations, Brazil-Education. Retrieved August 15, 2008. ↑ Santiago.cl, Education. Retrieved August 15, 2008. Daniels, Howard, Marilyn Bizar, and Steven Zemelman. Rethinking High School: Best Practice in Teaching, Learning, and Leadership . Heinemann, 2000. ISBN 0325003246. Franklin, Barry M., and Gary McCulloch (eds.). The Death of the Comprehensive High School? Historical, Contemporary, and Comparative Perspectives. Palgrave Macmillan, 2007. ISBN 1403977690. Marsh, David D., and Judy B. Codding (eds). The New American High School. Corwin Press, 1998. ISBN 0803962266. Mondale, Sarah (ed.). School: The Story of American Public Education. Beacon Press, 2002. ISBN 0807042218. Omatseye, Jim Nesin, and Bridget Olirejere Omatseye. Going to School in Sub-Saharan Africa. Greenwood Press, 2008. ISBN 0313340714. Owings, William, and Leslie Kaplan. American Public School Finance. Wadsworth Publishing, 2005. ISBN 0534643728. Postiglione, Gerard A., and Jason Tan (eds.). Going to School in East Asia. Greenwood Press, 2007. ISBN 0313336334. Rohlen, Thomas P. Japan's High Schools. University of California Press, 1983. ISBN 0520048636. This page was last modified on 19 September 2008, at 14:28.